Princess Cora is alone and unhappy. She’s tired of being prepared for her role in life. Studying how to run a kingdom is so boring. Cora wants a dog to play with, to get dirty, and have some fun. In desperation she writes a letter to her Godmother to help her. 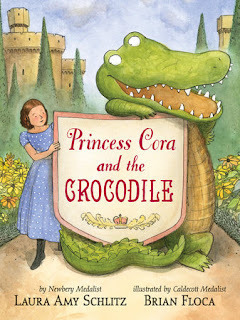 She is sent a crocodile to take her place, while she goes out to have some fun. But, can a crocodile who behaves badly take the place of a princess, even temporarily? For the first time in her life, Cora is free to climb trees, eat strawberries, wade in pools and just play. The crocodile is keeping the King, Queen, and Nanny occupied. Cora returns to the castle a different person. Through her adventures, she has found the courage to speak out against all the things she hates about her life. And she wants a dog. Meanwhile, her parents have realized what being shut up in a room all day means. This brings about change and harmony to the family. I loved the stunning illustrations in this book created by Caldecott Medalist Brian Floca, in fine line artwork, and soft pastel watercolours. Laura Amy Schlitz is a Newbery Medalist whose outstanding novel, The Hired Girl, I simply adored from beginning to end. Themes of compromise, understanding and the importance of play for children are focused on here. This elegant and beautifully presented book comes with a gorgeous slip jacket.